Late night shenanigans after the hash last night. A small group wandered over to Flatiron. 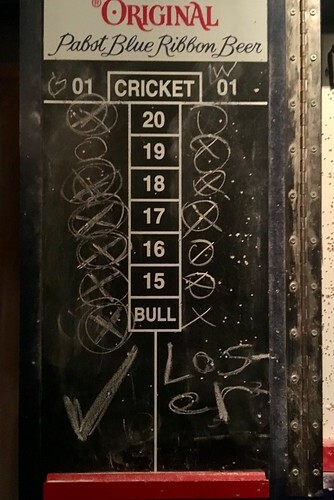 Rumor has it that I lost at darts to Glory Mole; the photo proves it. Tuesday Tale of the Tape: 208.0 pounds (+0.2 from last week’s weigh-in), I was hoping for a better result. I was always told to do service at 15k intervals, is 50k the new 45 or the new 60? Service at 15K? Maybe for an oil change. Transmission, etc. mine is recommended at 50K. 15 & 45 were just check over everything appts. or – at least that’s what my Vietnamese mechanic always told me. 15K seems like a waste of money….unless they’re doing it gratis. I try to follow doing all recommended work on the recommended schedule, but let’s face it, I haven’t. Hennessy did themselves a disservice (see what I did there?) by not texting me their addition service recommendations until I was already back on the road headed to work. Holy cow, already almost 10:30!! How time flies when the $hit hits the fan. Glad we caught it before it really got ugly. The first piece of metal is on the roof. Hopefully square and I can progress with the rest once Debbie gets home from… (wait for it) New Orleans!! How nice it would be to both be there at the same time! I want her home when I’m working on a very slippery metal roof, so at least she will be able to call 911 when I fall. Exercise needs to be a part of my day, but recently I just haven’t felt motivated (See Black Sheep this past Sunday). I’ve been sweating, but just not raising the heart rate. Apparently, Glory Mole got some skilz- your darting used to be passable, if I recall. Paulie was clearly the better player, I just got lucky at the end. And he threw left-handed half the game. got a message about a bike repair that someone needs help with tonight. We just may have to eat some Tasty China on the deck. Last time I was there – it was good, but not great. We will see tonight – but some Dan Dan Noodles really sound good right now. I hope they are delicious. I have not eaten TC since we all last me up there many months ago. See if you can find out about the ownership change, because I think it did. We weren’t really impressed the last time we went either. Still good, but not up to standards. Oooh bamboo fish! Oh I might need to find a reason to make it back up to TC soon. we are having some Bamboo Fish FOR SURE tonight. I went to Zoe’s Kitchen for lunch- I think it seems way too “healthy”, but it was tasty. lots of veggie options for you Paulie. I went to the one in the Perimeter Mall area years ago and was unimpressed. Well it took me longer than it should have, but I finally broke the news to my coworker hat my name isn’t “Jeff”.